The 8-track tape may be obsolete, but the Dainese 8-Track Perforated Leather Jacket might as well be a subscription streaming service coming out of wireless speakers. Artemide refined full-grain cowhide leather gives the 8-Track Jacket an old school sheen with modern day robustness. Leather perforations provide a bit of air-flow at speed. 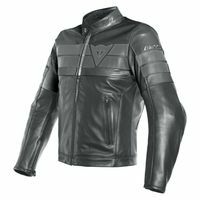 CE armor at the elbows and shoulders along with specific design features allow the jacket to meet CE – Cat. II – prEN 17092 certification. Slide in an optional back protector (sold separately) to upgrade the impact protection. A removable thermal liner allows you to stretch the 8-Track into cooler temperatures and can even be used as a separate mid-layer. The Dainese 8-Track Perforated Jacket is is named after some tech from the 60s, but its function is as state of the art as it gets for motorcycle gear.